If there was one thing I was hoping for, with Andy Samberg as the host of this year’s Emmys, was a good, entertaining show. And when the Emmys began, I was excited. The opening was fantastic. From the production value of the audio-visual presentation, to the writing of the song performed, I enjoyed how they made it relevant to shows such as THE UNBREAKABLE KIMMY SCHMIDT and THE LAST MAN ON EARTH, to some extent. It was really funny to see Jon Hamm, Kerry Washington and others in the mix. Taking it forward was the joke about the number of shows that are about a wife or wives. I’ve always been fascinated by our fascination for the stories of ‘wives’ (but I’m not talking about the reality show wives), so it was good to see that there have been other observations about that. And then the act went off a little, with the Les Misérables act, which made no sense at all, and just as Will Forte’s Inspector Javert fell off the bridge, things began to fall apart as well. 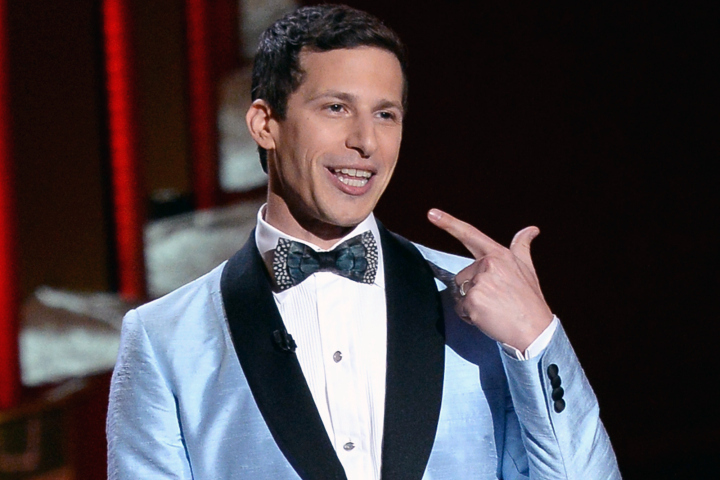 Andy Samberg didn’t have much to go on with after that. A few highlights of him as host did include when he joked about how TRUE DETECTIVE ‘was over’ even though it was still on the air. And later, his inappropriate ‘tribute’ to the last season of GIRLS (going down on the large Emmy on stage) was kind of funny, if you got the reference. 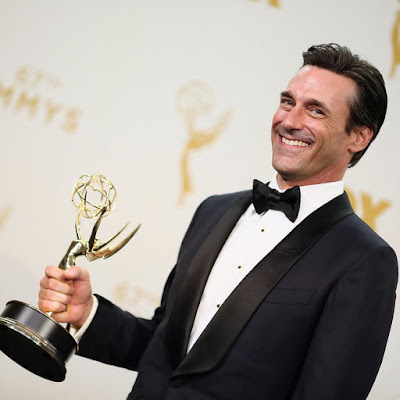 Another fun moment was when he and Seth Meyers joked about giving an award to the ‘World’s Best Boss’ indicating that it would be their ex-boss, Lorne Michaels, the creator of SNL. What followed was the prize, a lame mug, which was hilarious, especially when they opened the envelope and declared that the winner was actually Shonda Rhimes! Beyond those moments, there was nothing else that kept the show interesting. In fact, showing Tatianna Maslany and Tony Hale looking for metal on the red carpet, and finding cans of beans, fell completely flat. The presentations were also rather dull. 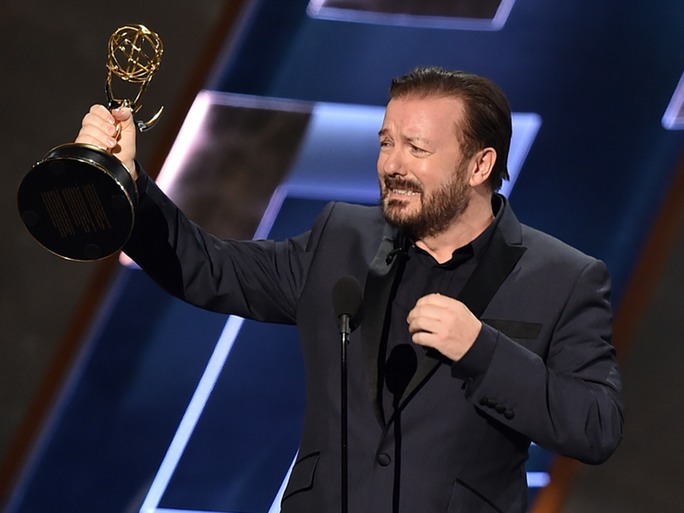 Ricky Gervais was one of only two of the most memorable and entertaining presenters. Him coming up and talking about how people might think that he’s won an Emmy, even though he hasn’t, and how posing with a statuette might perpetuate that even, was hilarious. It was fresh and different from the usual. Also fresh was Jimmy Kimmel, talking about how he could just mention any of the nominees on opening the envelope and no one would know who actually won. That is something I have wondered. And when an event is aired live, if someone were to actually do that, it could really mess things up. Kimmel’s chewing up the envelope bit to keep the true winner of lead actor—comedy a secret was interesting. So even if later Will Forte joked about making out with Kimmel, and then ‘found the chewed envelope bit in his mouth’ to confirm that that Jeffrey Tambor had indeed won, it was still funny. Apart from these, there really weren’t any noteworthy presentations, except for maybe Tracy Morgan’s, when he talked about his recovery from the accident he was in. However, when you’re about to announce the big, final award of the evening, I’d really prefer if you’d pick someone who won’t lose focus. Yes, it was good to see Morgan talking about things positively, but I’m sure it would have been just as endearing and nice to hear, earlier in the show—when presenting an award for variety series, perhaps. Finally, the awards. If there’s one thing the Academy did this year, it was mix things up completely. Well, not completely. Julia Louis-Dreyfus did win again, as expected. Jeffrey Tambor’s win was expected as well. Maybe even Allison Janney’s was predictable (but well deserved). However, MODERN FAMILY didn’t win, and while that was disappointing for me (I really wanted to see them breaking a record), I was happy to see VEEP win. It’s a brilliant show and deserves the victory. Although, with the Emmy for writing, and two acting awards, one should’ve seen outstanding comedy series going to VEEP. Likewise with GAME OF THRONES. After the writing and directing Emmys and Peter Dinklage’s second Emmy for his role on …THRONES, it wasn’t such a huge surprise that it won outstanding drama series. 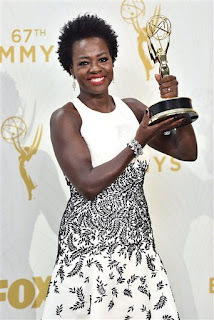 Viola Davis winning HOW TO GET AWAY WITH MURDER was good. I loved her acceptance speech the most, I think, especially with the mentioning of black actresses who have helped pave the way for others like her. 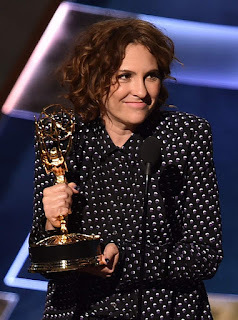 Hers and Jeffrey Tambor’s speeches were the best in my opinion. I’m just glad that none of the AMY SCHUMERs and KEY & PEELEs won. It’s bad enough that the Academy gives them spots in mainstream acting categories, which I don’t understand, since there is a separate set for variety and talk categories. 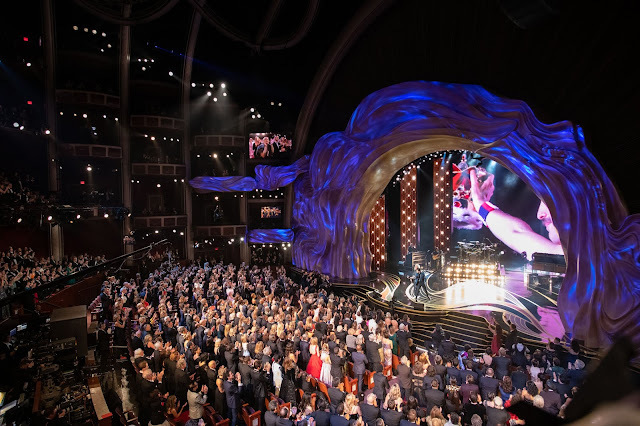 The Academy should really include a couple of performance categories in that set itself, which would also help in recognizing others who are deserving as well. 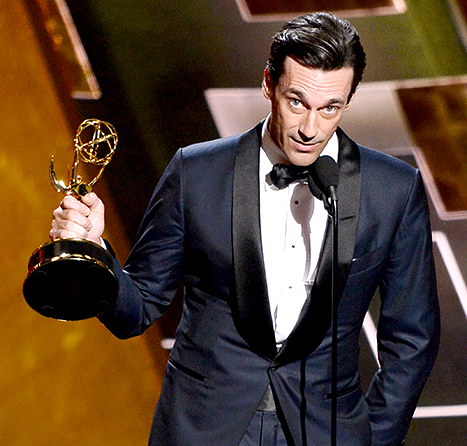 But the best thing was to see Jon Hamm winning. It was a win that’s been long overdue. Even though I was convinced that the Television Academy wouldn’t let the leading man of their once loved and cherished series go unrecognized for a role he’s excelled at for eight years, and has been nominated for eight times. He looked great and his going up to accept, by dragging himself onto the stage, was heartwarming. It was like he could finally take a sigh of relief. Whatever it actually was, it kind of felt like it signified the end of a long wait. And here are all the major awards.